Second division Hill Celtic pulled off quite a shock at the Regional Park on Saturday when they scored a 2-1 advance over first division Ballincollig to reach the semi-finals of the Murphy’s Stout AOH Cup. Celtic scored their goals in the first quarter. Ballincollig pulled one back in the second half but the visiting defence withstood severe pressure and held on to make the last four. 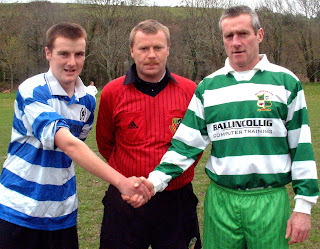 Thomas Galvin, Anthony Hogan (who scored a hat trick for Ballincollig in the 1986 final against Douglas Hall) and Barry O’Driscoll all went close for Ballincollig before Hill Celtic scored against the run of play in the 16th minute when Brian O’Farrell sent Brendan Healy through to tally. Four minutes later, Trevor O’Mahony failed to clear his lines and paid the price when Hill’s James Dorgan gained possession and slammed the ball into the back of the net. Ballincollig came out in the second half with all guns blazing and all the pressure paid off in the 73rd minute when Pa Flanagan, from a wide position on the left, looped the ball over the Hill Celtic goalkeeper Eoin Mullholland to make it 2-1. But the Hill defence refused to panic, stood firm. Ballincollig: Owen Walsh, Adrian Brady, Declan Flanagan, Matthew O'Regan, Trevor O’Mahony, Pa Flanagan, Terry Coomey, John Kelleher, Anthony Hogan, Thomas Galvin and Barry O'Driscoll. Subs used: Richard O’Brien for O’Driscoll (35th minute), John McAlpine for O’Mahony (60th), and Jason O’Leary for Galvin (73rd). Hill Celtic B: Eoin Mullholland, Bart Dunlea, Brendan Healy, John O’Farrell, Gearoid Webb, Paddy O’Leary, Paul Hannon, Tim Kearney, James Dorgan, Brian O’Farrell and Michael O'Reilly. Subs used: Wayne Kingston for O’Leary (54th minute) and Ray Murphy for Dunlea (66th).